Crown Pointe Church of the Assemblies of God, located in Lee’s Summit, MO, recently upgraded the sound system in its 500-seat sanctuary with a QSC Audio KLA Fixed Arcuate Active Line Array Loudspeaker System, as well as KW Series speakers for out fill. The new QSC Audio KLA line array replaced an aging speaker system that was no longer performing adequately nor achieving desired sound quality. The replacement array comprises six KLA12 12-inch, 2-way, self-powered loudspeakers and four KLA181 18-inch active subwoofers, installed three over two per side. One KW152 15-inch, two-way trapezoidal cabinet was additionally installed on each side as out fill in order to extend coverage to the extreme left and right seating areas of the sanctuary. 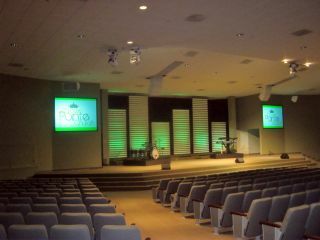 According to Richard Troutman, senior design consultant at Advanced Sound & Communications, who handled the design and install of the project, aesthetics were very important to Crown Pointe Church’s Worship Pastor, Nick Wright. As a result, the entire QSC Audio speaker system was flown, including the subwoofers.